2018 was a great year for the Go ecosystem, with package management as one of our major focuses. In February, we started a community-wide discussion about how to integrate package management directly into the Go toolchain, and in August we delivered the first rough implementation of that feature, called Go modules, in Go 1.11. The migration to Go modules will be the most far-reaching change for the Go ecosystem since Go 1. Converting the entire ecosystem—code, users, tools, and so on—from GOPATH to modules will require work in many different areas. The module system will in turn help us deliver better authentication and build speeds to the Go ecosystem. This post is a preview of what the Go team is planning relating to modules in 2019. Go 1.11, released in August 2018, introduced preliminary support for modules. For now, module support is maintained alongside the traditional GOPATH-based mechanisms. The go command defaults to module mode when run in directory trees outside GOPATH/src and marked by go.mod files in their roots. This setting can be overridden by setting the transitional environment variable $GO111MODULE to on or off; the default behavior is auto mode. We’ve already seen significant adoption of modules across the Go community, along with many helpful suggestions and bug reports to help us improve modules. Go 1.12, scheduled for February 2019, will refine module support but still leave it in auto mode by default. In addition to many bug fixes and other minor improvements, perhaps the most significant change in Go 1.12 is that commands like go run x.go or go get rsc.io/2fa@v1.1.0 can now operate in GO111MODULE=on mode without an explicit go.mod file. Our aim is for Go 1.13, scheduled for August 2019, to enable module mode by default (that is, to change the default from auto to on) and deprecate GOPATH mode. In order to do that, we’ve been working on better tooling support along with better support for the open-source module ecosystem. In the eight years that we’ve had GOPATH, an incredible amount of tooling has been created that assumes Go source code is stored in GOPATH. Moving to modules requires updating all code that makes that assumption. We’ve designed a new package, golang.org/x/tools/go/packages, that abstracts the operation of finding and loading information about the Go source code for a given target. This new package adapts automatically to both GOPATH and modules mode and is also extensible to tool-specific code layouts, such as the one used by Bazel. We’ve been working with tool authors throughout the Go community to help them adopt golang.org/x/tools/go/packages in their tools. As part of this effort, we’ve also been working to unify the various source code querying tools like gocode, godef, and go-outline into a single tool that can be used from the command line and also supports the language server protocol used by modern IDEs. The transition to modules and the changes in package loading also prompted a significant change to Go program analysis. As part of reworking go vet to support modules, we introduced a generalized framework for incremental analysis of Go programs, in which an analyzer is invoked for one package at a time. In this framework, the analysis of one package can write out facts made available to analyses of other packages that import the first. For example, go `vet`’s analysis of the log package determines and records the fact that log.Printf is a fmt.Printf wrapper. Then go vet can check printf-style format strings in other packages that call log.Printf. This framework should enable many new, sophisticated program analysis tools to help developers find bugs earlier and understand code better. One of the most important parts of the original design for go get was that it was decentralized: we believed then—and we still believe today—that anyone should be able to publish their code on any server, in contrast to central registries such as Perl’s CPAN, Java’s Maven, or Node’s NPM. Placing domain names at the start of the go get import space reused an existing decentralized system and avoided needing to solve anew the problems of deciding who can use which names. It also allowed companies to import code on private servers alongside code from public servers. It is critical to preserve this decentralization as we shift to Go modules. Decentralization of Go’s dependencies has had many benefits, but it also brought a few significant drawbacks. The first is that it’s too hard to find all the publicly-available Go packages. Every site that wants to deliver information about packages has to do its own crawling, or else wait until a user asks about a particular package before fetching it. We are working on a new service, the Go Module Index, that will provide a public log of packages entering the Go ecosystem. Sites like godoc.org and goreportcard.com will be able to watch this log for new entries instead of each independently implementing code to find new packages. We also want the service to allow looking up packages using simple queries, to allow goimports to add imports for packages that have not yet been downloaded to the local system. Today, go get relies on connection-level authentication (HTTPS or SSH) to check that it is talking to the right server to download code. There is no additional check of the code itself, leaving open the possibility of man-in-the-middle attacks if the HTTPS or SSH mechanisms are compromised in some way. Decentralization means that the code for a build is fetched from many different servers, which means the build depends on many systems to serve correct code. The Go modules design improves code authentication by storing a go.sum file in each module; that file lists the cryptographic hash of the expected file tree for each of the module’s dependencies. When using modules, the go command uses go.sum to verify that dependencies are bit-for-bit identical to the expected versions before using them in a build. But the go.sum file only lists hashes for the specific dependencies used by that module. If you are adding a new dependency or updating dependencies with go get -u, there is no corresponding entry in go.sum and therefore no direct authentication of the downloaded bits. For publicly-available modules, we intend to run a service we call a notary that follows the module index log, downloads new modules, and cryptographically signs statements of the form “module M at version V has file tree hash H.” The notary service will publish all these notarized hashes in a queryable, Certificate Transparency-style tamper-proof log, so that anyone can verify that the notary is behaving correctly. This log will serve as a public, global go.sum file that go get can use to authenticate modules when adding or updating dependencies. We are aiming to have the go command check notarized hashes for publicly-available modules not already in go.sum starting in Go 1.13. Because the decentralized go get fetches code from multiple origin servers, fetching code is only as fast and reliable as the slowest, least reliable server. The only defense available before modules was to vendor dependencies into your own repositories. While vendoring will continue to be supported, we’d prefer a solution that works for all modules—not just the ones you’re already using—and that does not require duplicating a dependency into every repository that uses it. One potential problem with mirrors is that they are precisely man-in-the-middle servers, making them a natural target for attacks. Go developers need some assurance that the mirrors are providing the same bits that the origin servers would. The notary process we described in the previous section addresses exactly this concern, and it will apply to downloads using mirrors as well as downloads using origin servers. The mirrors themselves need not be trusted. We are aiming to have the Google-run module mirror ready to be used by default in the go command starting in Go 1.13. Using an alternate mirror, or no mirror at all, will be trivial to configure. Finally, we mentioned earlier that the module index will make it easier to build sites like godoc.org. Part of our work in 2019 will be a major revamp of godoc.org to make it more useful for developers who need to discover available modules and then decide whether to rely on a given module or not. This diagram shows how module source code moves through the design in this post. Before, all consumers of Go source code—the go command and any sites like godoc.org—fetched code directly from each code host. Now they can fetch cached code from a fast, reliable mirror, while still authenticating that the downloaded bits are correct. 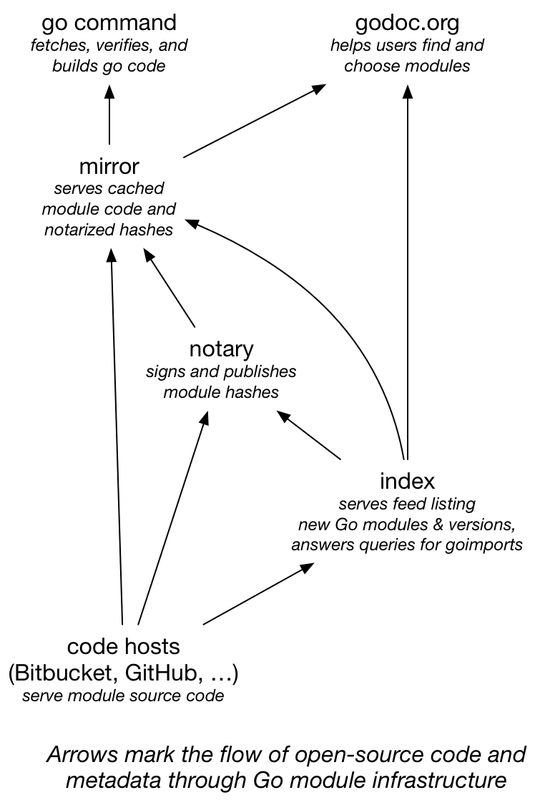 And the index service makes it easy for mirrors, godoc.org, and any other similar sites to keep up with all the great new code being added to the Go ecosystem every day. We’re excited about the future of Go modules in 2019, and we hope you are too. Happy New Year!